I have been using another brand of dryer balls for some time now. They are much smaller and lower quality. They seem to have fallen apart over the last few months. I only had three. I started using six Woolzies almost a month ago and they are holding up very well. They are much larger than the other brand and don't thump around in my dryer. There has been a noticeable difference in the amount of time it takes for a load to dry. They claim to last at least 1,000 loads or your money back! 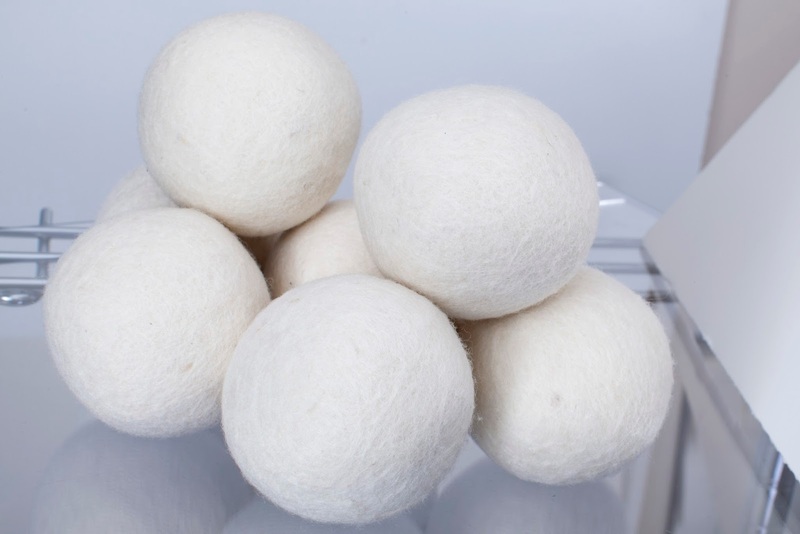 How do wool dryer balls work? The dryer balls go in the dryer with your wet laundry. As they toss and turn the balls help to separate the clothing, thus drying the load faster. The more you have the better. When you pull the dry clothes out, make sure to get all your wool dryer balls back into the dryer for the next load. *You may end up with some stragglers. That's why it's so handy having more than six of them! Personally, I haven't noticed a difference in static. I find the best way to reduce static is to not use polyester fabric or dry it separately from your natural ones. Avoiding over-drying also helps. Instead of using scented dryer sheets I just add a few drops of essential oil to one of the wool balls and it lasts a few loads. Along with shorter dryer time this saves us money. I highly recommend this brand!